In the past I have written a few articles centered around particular cards and what you could do with them. Those cards were usually extremely flexible and offered multiple possibilities for deckbuilding. What I realized is that those cards are what I call ‘engine cards’ and that understanding them can be an amazing tool in improving ones deckbuilding skill. Allow me to take you onto a journey: First I will explain what they are and then look over a few that are currently available in Gentry. In the end, there will be a decklist. For the sake of this article we’ll need to generalize this definition and translate it into Magicese so it becomes: “A card for converting one resource into another resource or effect to produce card advantage or tempo”. That sounds impressive right? Enigines in magic can be active, using an activation cost that has one resource and generates another, or passive, using a trigger that gives you one resource on top of another. In addition, since these type of cards have a potential to spiral out of control they are often limited to a single use per turn or even per round, so there are both free and restricted engines. Enough theory! First, congratulations on making it through that boring block of text above. Next lets look at some cards that fall under ‘engines’. Do you know what card I am talking about…? I assume some of you guessed it already: It is Hidden Stockpile. 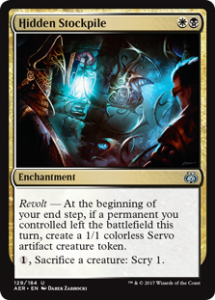 It has an activated ability that turns permanents and mana into a scry effect, which, by most accounts, is a horrible deal.To make up for that poor deal it gives you back a permanent, but because that is too good a deal it is being restricted to once for each of your own turns. Every Gentry player knows that a single stockpile is something you should be able to handle, it is only when multiples enter the fray that its true power starts to shine. Trigger based engines share this quality and are in contrast with engines that run on an activated ability since you have to pay the cost each time to get the effect. 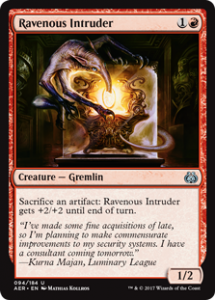 That brings us to our second example, and one that people who have played against me recently will recognize: Ravenous Intruder. It is an unlimited activated ability based engine that turns artifacts into two power and toughness. A large amount of power is a path to victory, either on itself or aided by spells that give double strike, trample, or are called Fling. This brings us to the goal different engines have. Some engines are made to be explosive, others aim more to grind. The two above engines are great examples of this, Hidden Stockpile is best in a scenario where for a bunch of turns you are scrying to get the best cards, get extra advantage off Evolving Wilds and Renegade map while churning out an ever increasing number of tiny monsters. On the other hand Ravenous Intruder shines when it comes out of the blue, eats an entire board and hits for 20+ damage in one blitz attack. That does not mean they are limited to filling that task, Hidden Stockpile can eat your entire board to dig for that answer you desperately need and Ravenous Intruder can play a decent grinding game when coupled with a bunch of Implement of Combustion and Servo Schematics to trade or fend off a bunch of larger creatures. That brings us to the beginning of the chain, the resources you put in the machine in order to get it running and generate the effect on the other side. Most engines simply aren’t worth it as a magic card if you look at them from a value perspective, usually the exchange rate between one resource and another is not worth the card in between. You often only get an equal or down trade that does not justify the actual card that is the engine. By using fuel type cards you offset this bad trade. And again there are multiple types of good fuel in Magic. Self replacing fuel is the easiest to understand. It is a resource that replaces itself. The Implement cycle is a great example of this if it is used as fuel for an engine that requires you to sacrifice artifacts or permanents. Does that mean it is free? No, it doesn’t, you still need to put mana into it but it turns “pay mana for a permanent and then lose it” into “pay mana”, in effect translating what the starting point of your fuel line is. You can then push this further to include Foundry Inspector to turn it into a completely free resource. 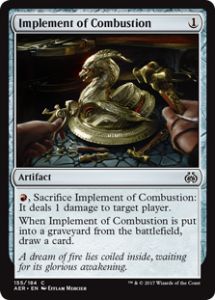 This type of fuel breaks the rule that a card should represent a single use of a fuel unit. A great example is a token generator that is used as fuel for a “sacrifice a creature” cost. The fair way to pay for this effect is to sacrifice a creature card, lose it and get the effect once. You break parity with cards like queen’s commision or a flipped Adanto, the First Fort. Multiplicative fuel can take two forms, a burst that suddenly generates more than you’d expect, like the aforementioned Commision, or a repeating source, like Adanto. Engine and fuel type cards can be part of any deck. Repeating sources can be a very strong source of pressure in the mid game where incremental benefits are allowed the time to overwhelm more conventional effects. On the other hand, burst type effefcs can push through an advantage or turn a game around by supplying just enough boost to offset the status quo in a game. A deck combining Hidden stockpile with Evolving Wilds and Renegade Map is an example of this. It is possible to build a “normal” grindy kind of deck around this that keeps piling up advantages with Renegade Rallier and Unbrideled Growth. It keeps churning out lowly 1/1 servo creatures essentially for free while generating other effects. If you add red cards instead and go for Ravenous Intruder and Fling suddenly you are building towards a near unstoppable burst instead of the death by a thousand stings. To close this all off I would like to show you the core I have been working with and how it is evolving. Bontu’s Monument, Oathsworn Vampire, Pitiless Plunderer, Defiant Salvager. Put these four cards in play together and you create an endless loop that kills your opponent. 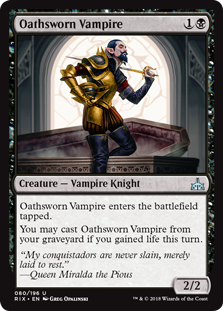 The monument lets you drain a life whenever a creature is cast, that allows your Oathsworn Vampire to be played from the Graveyard for only 1 black mana since the monument also makes your creatures cheaper. 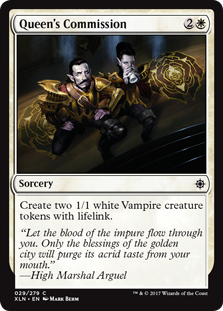 Pitiless Plunderer makes a Treasure every time the Vampire is cast and pays for that single black mana while Defiant Salvagers puts it back into the graveyard. A four card combo. This is what people would call Magical Christmas Land, something that never actually happens. Why then am I putting time into turning this core into a proper deck? It is simple really, it is because almost all parts of the combo have interactions among themselves that generate advantage. Plunderer and Salvager together double the fodder for the Salvager, making him too big to handle in combat, for example. In that vein there are advantages to be found in many of the two-card and three-card combos. In fact, I only comboed in 2 games out of 10 and managed to go 3-1 in Bredene. So we have decided on a core, next up is deciding how we want to shape the rest of the deck. Like in the Stockpile example we can look to add colors, make the deck grindy or explosive, and more or less reliant on the actual combo, or even add side combos. I decided to try and stick to a single color, thus maximising the effect the Monument-Salvager-Oathsworn combo has as the amount of Black Mana available is the limiting factor in that interaction. Then I went looking for other cards that would serve as extra pieces of fuel or engine pieces. Here that meant adding Dusk Legion Zealot and Yahenni, Undying Partisan. In an ideal world we would want another permanent that has “Sacrifice a creature” as a repetitive cost to generate an effect that fits into the kill strategy but that is currently unavailable in these colors. After these two the amount of options I would consider auto includes start drying up. Doomed Dissenter is the next best thing in the fuel department, after that we need to go look for options outside the actual combo. It is here where the deck becomes “your” deck. Are you adding removal to play fair in Fatal Push, Ravenous Chupacabra and Golden Demise? Would you prefer adding a secondary path to victory with Ruthless knave and Revel in the Riches to use the treasures from the Pitiless Plunderer as another means for victory? It is up to you. Next time you see a card and think “what a useless and random effect” try to think what you would need to make it an awesome centerpiece of a deck. Then go look for that effect in the Standard legal list of cards and build a crazy deck. And if it doesn’t exist you will from then on understand my excitement when a new set comes out that features just the silly and seemingly unplayable effect you were looking for. And it will be that glorious moment, after cursing me for making you look for cool decks like this , you will understand why I wanted…. Nay, NEEDED to write this article.